These are JUST what you closet needs. 1. An adorable dress with pleating on the bust and a minimal silhouette you can easily transition from day to night. 2. A floor-length dress with a mermaid bottom and sweetheart neckline sure to be the most envied gown at the ball. 3. 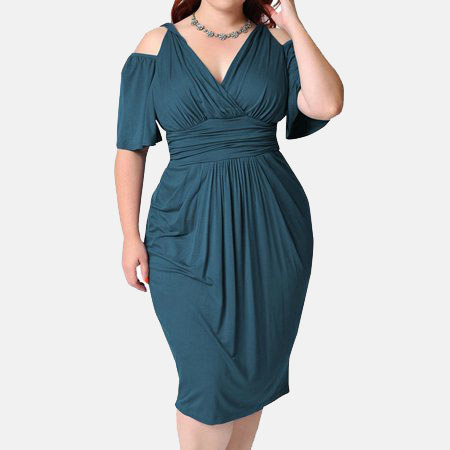 A curve-hugging dress with fabulous draping that’ll surely steal the show. 4. A pretty sleeveless velvet dress that’ll be all the talk of your next get-together. 5. A chic swing dress with a halter neckline to bring some serious attitude to your wardrobe. 6. A mock-neck midi dress that'll give your outfit all the mod vibes. 7. An off-the-shoulder dress with long sleeves you can rock to endless functions. 8. A sweater dress with chic shoulder cutouts to bring a little edge to any look. 9. A short sleeve dress with fun stripes on the hem sure to be your new go-to. 10. A dashing V-neck dress with gold beading at the waist and an open back that’ll make for some magical looks. 11. A vintage-style dress that features floral lace, a pleated skirt, and exposed back for a sultry new addition to your closet. 13. A sequined off-the-shoulder gown guaranteed to have you feeling like royalty at your next gala or formal party. 14. A fabulous wrap dress that’ll bring some serious attitude to any wardrobe. 15. A vintage-style dress with an oversized bow which’ll be your new fave. 16. A floor-length gown with an empire waist and flutter sleeves can make you a vision no matter where you wear it. 17. A mesh sleeve dress with a gorgeous striped pattern sure to make you the best dressed person at the function. 18. A polka dot wrap dress that’ll have you ready to dance all night with its ruffled hemline and sleeves. 19. A stunning ruched gown with lace sleeves everyone will SWEAR you paid a fortune for.